LAS VEGAS - CES 2019, the world's gathering place for all those who thrive on the business of consumer technologies, is in full swing, and the name of the game for 2019 is AI. Tons of companies are pitching and launching products with artificial intelligence, some of which have very hefty price tags. But not all new tech has to be super-sophisticated -- or super-expensive. We’re on the ground in Las Vegas, and aside from some of the products you may have already seen or heard about (lots of robots, big, BIG TVs and so much auto-tech) we ran across a few products ranging in price from less than $50 to well into the thousands. And all of it will be available by the summer. In case you haven’t heard, Alexa is heading for your car and doing it in a variety of ways: Amazon tech, third party add-ons and full on audio systems. First to launch (and they’ve actually been quietly shipping them out since December) is Amazon’s Echo Auto. If you asked for an invitation back in September (Amazon said they received over 1 million requests), you’ll be getting it soon for $24.99. When the honeymoon period (invite-only period) is over, the price jumps to $49.99. 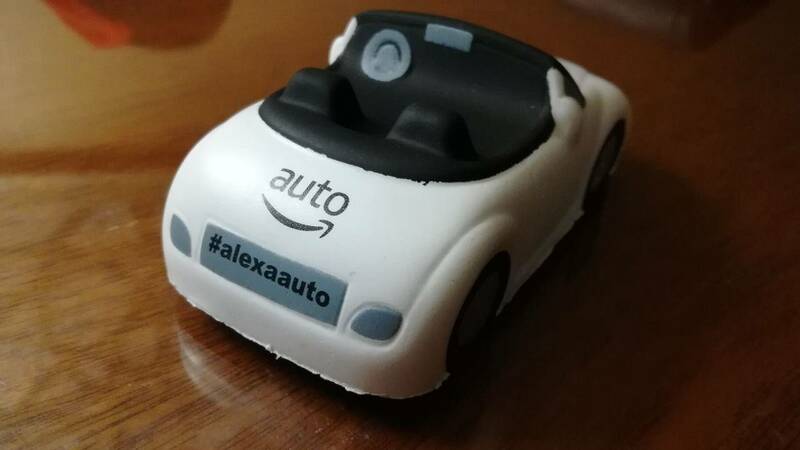 Echo Auto is small device that connects to your car via Bluetooth or through an auxiliary cable input. Why would you want Amazon’s virtual assistant in your car or truck? Just like at home, Echo Auto’s Alexa can perform the same tasks as the Echoes you have around the house. Need to set a timer or reminder or add an event to your calendar? Alexa can do that. Want to turn on Alexa-enabled devices like smart bulbs, plugs or switches from the car before you get home. Just tell her to do it. Want to make an announcement to all your Echo devices in the house? You can now do that from the car. And this is a pretty neat trick: You can have Alexa playback your favorite Amazon music playlists, stations, and music apps in the car (SiriusXM, did Amazon just get your attention?). If that’s not enough, try any one of the other 70,000+ skills Alexa supports. Echo Auto will also interact with your favorite map program -- ask for directions and Alexa will open up Google Maps, Waze, or Apple Maps on your smartphone. One of the most interesting Echo Auto third party devices is the iOttie Easy One Touch Connect with Alexa. The cradle attaches to your windshield and has dual microphones and noise-canceling software. When paired with your smartphone (Bluetooth only), like any Echo in your home it will provide you with the same functionality in your car. Pioneer, BOSS, and Jensen are all set to launch Echo Auto headend units. Echo Auto will also be baked into a dashcam as well. Amazon is shipping invite-only Echo Auto devices now -- iOttie says its device will start shipping in the first quarter of 2019. If you’re a big golfer and spend any significant time on the links, you’ve probably seen a CaddyTrek golf bag. Low price ones go for about $100; but their king-of-the-mountain bag costs $1,495. What do you get for that? How about an automated golf caddy on wheels that follows you around? Neat stuff, but CaddyTrek R2s are nothing new and have been around for a number of years. 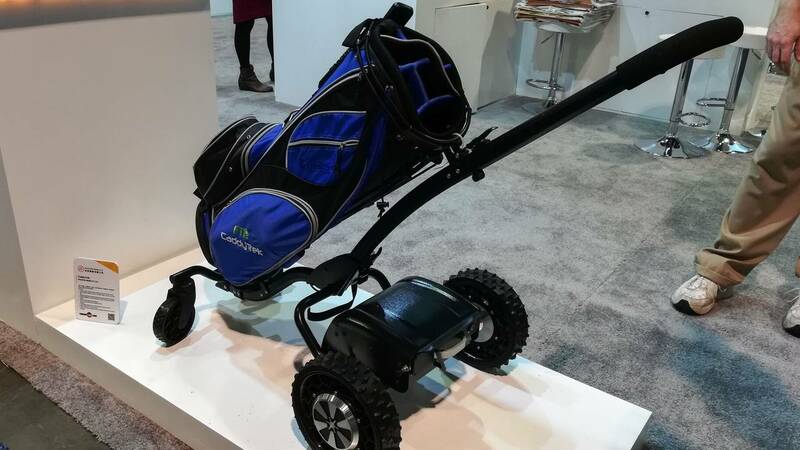 At CES 2019, the company is launching a new smart golf caddy called the CaddyTrek S Series. The S Series comes in at $1,095, and instead of it automatically following you around, you use a remote control to drive it forward, backward, left or right. Besides the lower price, the S Series adds obstacle avoidance AND offers the option to upgrade to a fully automated version (that will follow you around) for $400. The new CaddyTrek is uses two 250-watt electric motors, won’t tip over, and can still be pushed or pulled manually (though the company says the battery will last for about 42 holes of golf). Look for the new CaddyTrek S Series this May. It may look like a pretty ordinary carry-on hardside suitcase, but if you get the gist of where this is going, you’ve probably already guessed it. 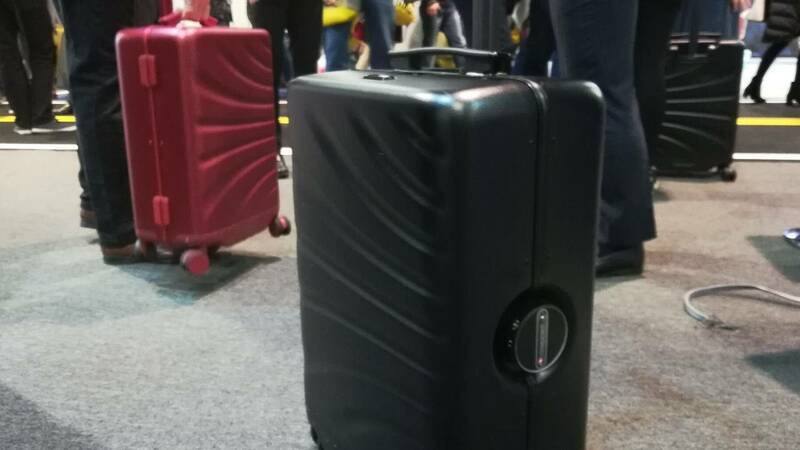 Yes, this suitcase will follow you through an airport. Unlike the CaddyTrek S Series which relies on a signal from a remote to keep up with its owner, the Rover Speed 20” uses AI technology to recognize who it belongs to. Here’s how it works: Users stand in to the side of the roller-bag and long press a button on the handle. A tiny camera takes a picture of you and stores it in the bag’s memory. From that, wherever you go, it goes, with a top speed of about 4½ mph and a range of 12 miles on a single charge. The tech on this bag includes a battery port with two USB ports for charging a phone or tablet. That tech also has a smartphone app to alert you when you and the bag are more than 12 feet away from each other (when not in follow mode). The bag’s battery can also be removed and used to charge devices. If this device looks and sounds familiar, it’s because the first generation (known as the Cowa Robot R1) was introduced a couple of years ago and used a bracelet to figure out who to follow. This upgraded version, now re-branded as the Rover Speed, dispenses with the bracelet in favor of artificial intelligence. The Rover Speed 20” is available now (in black or red) on eBay and Amazon for about $480. And by the way, Rover Speed was honored with a 2019 CES Innovation Award for another version of this product called the ShopPal. Got a cat and hate to clean up the litter box? As the saying goes, there’s now an app for that (and some hardware too). 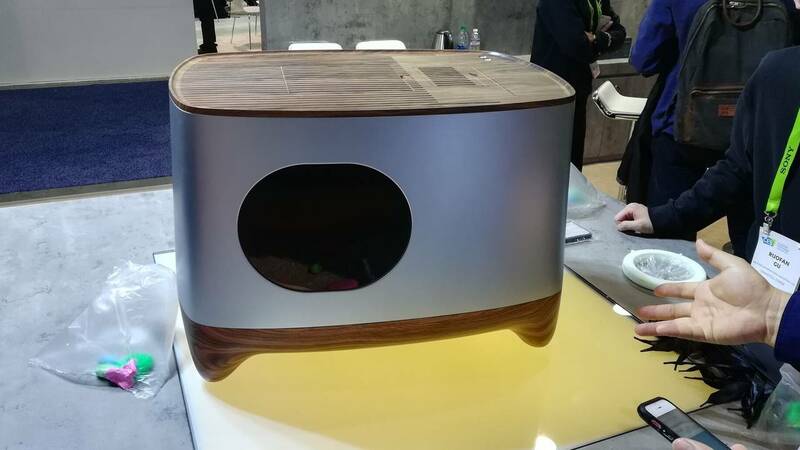 Launching this spring on Indiegogo, iKuddle is introducing a smart litter box for you and your feline friend. What does it do? Well, after your cat finishes his or her business, the litterbox scoops up the “stuff” and deposits it in a special part of the enclosed litter box. Once the box senses it’s getting close to full, it’ll send the human an alert that waste is ready to be bagged. Confirm you’re ready for bagging and the iKuddle THEN BAGS IT UP FOR YOU. WHAT?!?! Grab the sealed bag, drop it in the garbage, and the process starts all over again. iKuddle uses a battery pack that can hold a charge for 30 days. Alerts come to your smartphone via an app - and don’t worry about scaring your cat -- company reps tell us sensors only start the filtering process once the cat has left the box, and if it senses a cat coming in while filtering, it’ll automatically stop. Non-cat owners may think this is all somewhat ridiculous, but there’s a practical side to this: By constantly scooping the poop, iKuddle is producing a more sanitary litter box. That promotes better hygiene, less odor, and yes, keeps Mr. Kitty happier. iKuddle is not the first to come up with the idea for a smart litter box, but they are the first to do the bagging for you. Competition includes LavvieBot (launching in May also on Indiegogo) with a much bigger unit then the iKuddle. And the price for an iKuddle- not too, too bad at $299 (who says tech is cheap?). iKuddle debuts on Indiegogo in February with first units expected to ship out as soon as May 2019. Problems with your hearing are no joke (hence the lack of a witty-headline). According to healthy.hearing.com, about 48 million Americans (20% of the population) suffer from some sort of hearing loss. If you know anyone who uses a hearing aid, there are two common complaints: Batteries are expensive and need to be changed often or rechargeable ones take too long to charge. WIDEX, based in Hauppauge, New York, is trying to change that with a variation of its WIDEX EVOKE. 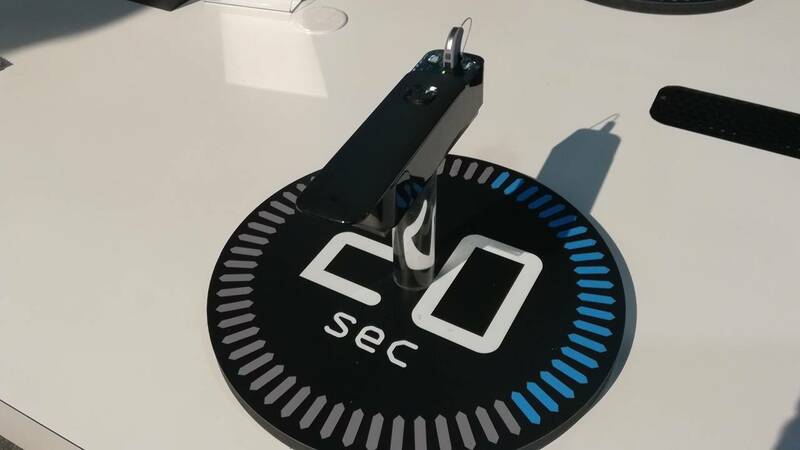 What makes the new line of Evoke hearing aids so revolutionary -- it was also a CES 2019 Best of Innovation Honoree -- is that the company did away with batteries and replaced them with energy cell technology. Without getting too technical, here’s how it works: Instead of hooking each hearing aid up to a cord and an outlet, the devices have an energy cell inside. The energy cell contains a small amount of methanol which reacts with oxygen to power the hearing aid. When the hearing aid needs to be “recharged”, it is placed in a small refueling unit. The refueling unit removes the spent fuel out and pushes new fuel into the hearing aid. Recharge time: 20 seconds. That’s right, 20 seconds. And charges last a full 24 hours. WIDEX says each cartridge is good for about a month of fuel and is aiming for a price-point that comes in under batteries that need to be changed out about once a week. Pricing for the WIDEX EVOKE with Energy Cell technology hasn’t been announced as of yet, but the company does expect to launch the new line of hearing aids (and cartridges) by the summer of 2019. The last product we ran across in a day on the floor at CES 2019 was not actually one new product from a company, but seven new products. TP-Link may be a familiar name to a lot of people for building affordable, quality wireless routers. In the past few years, the company has jumped head-first into home automation with a slew of smart bulbs, indoor plugs and wall switches. If you were an early adopter of TP-Link tech, you’ve probably noticed one thing missing from their lineup: an outdoor rated smart-plug. Well, no more. The company announced at CES that come February, they’ll be shipping a new Wi-Fi outdoor plug for about $45 that comes with two outlets that can each be individually controlled through their KASA app. 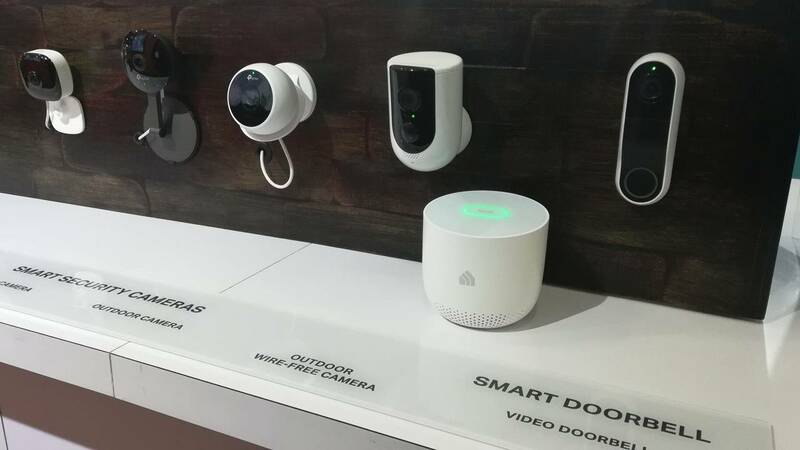 That outdoor smart plug is part of a lineup that includes a new wall outlet, two new indoor cameras, an outdoor camera (and hub), a doorbell, and a new Wi-Fi light switch with a built-in digital assistant, speaker, motion sensor, and nightlight. If that sounds like a lot, it is. Few and far between are examples of tech companies bringing to market so many new products all at once. For the first time, TP-Link also made public how well they’ve been doing. A company gave us the lowdown for their home automation business: over 2.6 million users, 3 million-plus app downloads, more than 6 million KASA smart home devices shipped, and a whopping 50 million-plus cloud transactions. Fragmented smart home products and a mish-mash of apps are starting to sort themselves out. Users are looking for one company and one app top do it all, and with its new line of products, TP-Link just put competitors like Arlo, August, Nest, Ring, and Zmodo all on notice.